R. Chumleigh is a New Vaudeville legend who performs throughout the civilized world and in the Dominion of Canada. Comfortable in any persona and historical period, Chumleigh is capable of filling any length of time from a minute to his critically acclaimed two hour one man show. Chumleigh’s no lowdown standup. 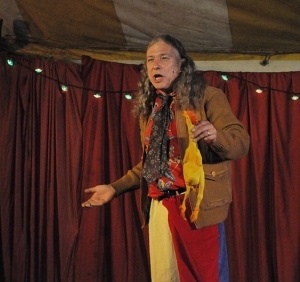 His specialty is grumpy comic anarchistic diatribe in the tradition of Jonathan Swift, Mark Twain, and Groucho Marx, but punctuated with Silly Stunts and Audience Involvement. WARNING It is a matter of great personal pride to Chumleigh that he DOES NOT JUGGLE nor does he need to, but he can provide hours of walk around ambiance in any theme and a completely harmless straight variety or circus performance without any satirical content whatsoever.